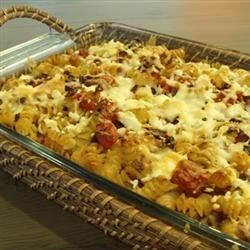 "Rotini pasta is tossed with tomatoes, kalamata olives, and peppers, topped with feta and Cheddar cheeses, and baked until golden brown and bubbly. Delicious." Preheat oven to 350 degrees F (175 degrees C). Bring a large pot of lightly salted water to a boil. Add pasta, cook for 8 to 10 minutes, until al dente, and drain. Heat oil in a large heavy skillet over medium heat. Saute onion, jalapeno, and green bell pepper until onions are soft and translucent. Stir in tomatoes, wine, and kalamata olives. Simmer 15 minutes. Toss pasta with sauce until evenly coated. Pour into a 9x13 inch baking dish. Sprinkle with feta cheese and Cheddar cheese. Bake 5 minutes in the preheated oven. Set oven to broiler setting. Broil for 5 minutes, or until topping is golden brown and bubbly. I thought this was okay as a side dish, but the kids thought it was boring. I think it needed more sauce and maybe some extra seasonings. This recipe was delicious. The wine gave it a wonderful flavor but I think it could be left out. My husband who is a very fussy eater also asked me to make it again. Great recipe!